Curry -- you either love it or you hate it. 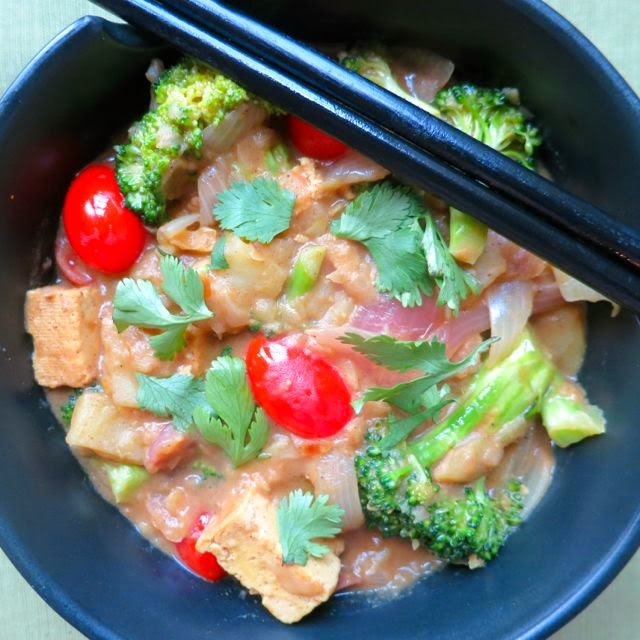 This one hails from the new book by Terry Hope Romero, Vegan Eats World . 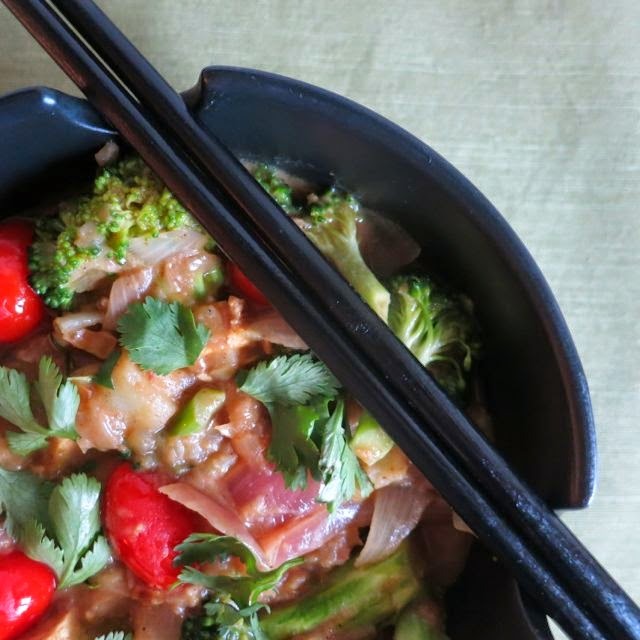 It's a deliciously spicy peanut curry with crunchy broccoli and soft potatoes. What really makes this dish unique is the spice mixture that includes 5-spice powder and garam masala -- so much flavor, so little time. With a touch of brown sugar and lime juice, garnished with fresh cilantro, you'll be amazed at how all these flavors come together. Serve it over black or brown rice. In a food processor or blender, pulse together shallots, garlic, garam masala, 5-spice powder, sea salt, turmeric, cayenne pepper, and ginger to form a curry paste. Cut the onion in half and into 1/2-inch-wide half-moons. Slice the tofu into cubes or triangles no thicker than 1/2 inch. In a large 3-quart pot with a lid, heat the oil over medium heat, stir in the curry paste with a rubber spatula or wooden spoon, and fry for one minute, stirring constantly. Add the onion and fry until softened, about 3 to 4 minutes. Stir in the tofu and potatoes. Meanwhile heat up vegetable broth and pour half of the broth into the pot over the potatoes. Add the coconut milk, increase heat to medium-high and bring to a gentle simmer. In a measuring cup, use a fork to combine the peanut butter and the remaining warm vegetable broth. Stir vigorously to create a creamy sauce. 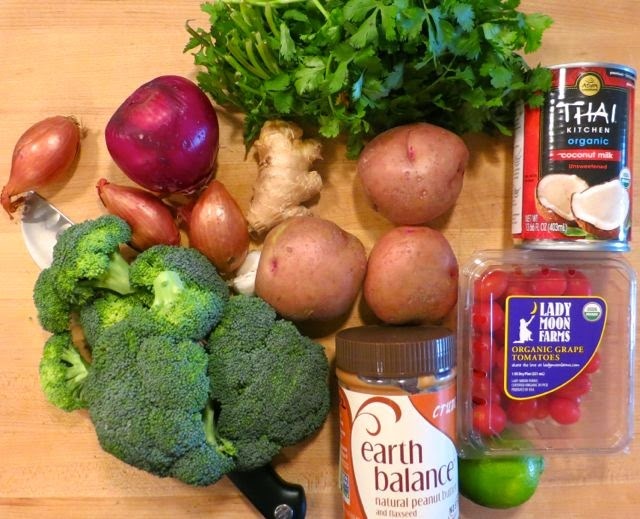 Whisk this into simmering curry, reduce heat to medium-low, and cover. Simmer the curry for 20 minutes or until the potatoes are very tender and can be easily pierced with a fork. Stir in the broccoli, cover, and simmer for 2 minutes or until the broccoli is crisp tender but still bright green. Add the cherry tomatoes, lime juice, and sugar, and stir. Taste the curry and adjust with more lime juice or salt if desired. Simmer for 1 more minute, turn off heat, cover, and let it rest for 5 minutes. Sprinkle with chopped cilantro and serve immediately over hot rice.